Add a small amount of oil to a large saucepan to stop the mince from sticking. Place the mince into the pan and cook on a medium heat until brown. Add the garlic and onion then cook until the onions are soft. Add the cumin, hot chilli powder, oregano and tomato puree to the mince then stir, making sure to coat it all. Add the peppers and tomatoes to the pan then cook for another 2 minutes and keep stirring. Add the tinned tomatoes and mushroom then turn the heat right down while you prepare your oxo stock. Crumble one oxo in to a jug with 100ml of boiling water, stir and add to the chilli mixture. Crumble the other oxo cube into the mixture and carefully stir as you will have quite a bit of liquid. Turn the heat back up on a medium heat and add the chocolate, stir carefully then watch the chocolate melt in to the chilli mixture. The chilli will start to darken. Add the fresh chilli then cover and simmer for half an hour. 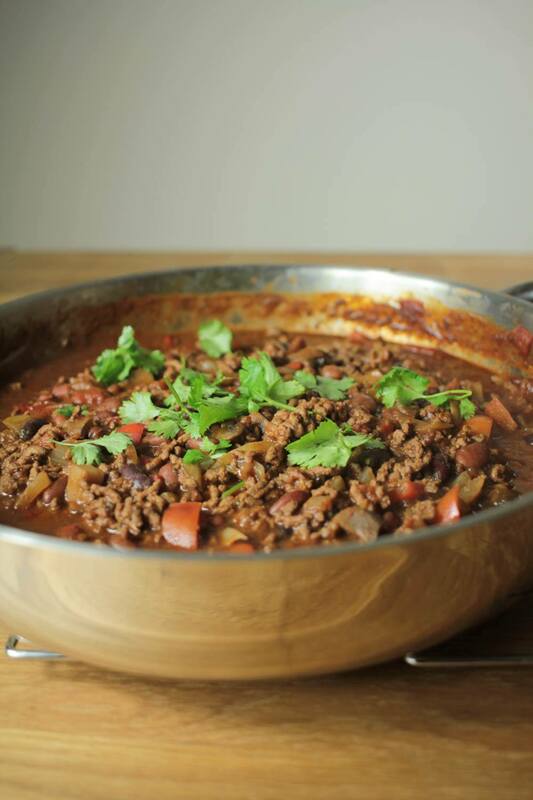 Check your chilli and give it a good stir. Have a taste and season with salt and pepper if desired. Add more chilli powder if you would like your chilli any hotter. Chop some fresh coriander and add to the pan. Add the mixed beans, stirring in well. Leave with the lid off turning up the heat if you would like to reduce some of the sauce for about 10-15 minutes. Serve with rice, nachos, tacos or fajita - whatever takes your fancy! Also great with extras such as guacamole and sour cream. Enjoy!